The history of softball dates back to 1887. While common conjecture assumes softball is the younger sibling of baseball (which isn’t too far off), this sport actually evolved thanks to cold weather, boredom, and a football game. Back in 1887, Yale and Harvard graduates were battling the chill and boredom during a Yale versus Harvard game. When it was discovered that Yale defeated its competitor, an enthusiastic Yale grad threw an old boxing glove at a Harvard spectator, who returned in kind by attempting to knock the glove back with a stick—his makeshift form of a bat. 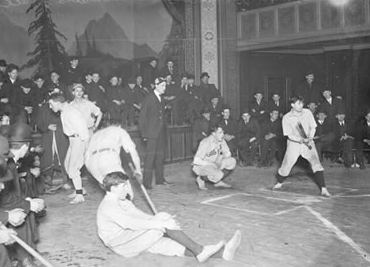 George Hancock watched with delight nearby, and concocted the idea of an indoor baseball game, and spectators flocked to play this impromptu game. He tied together a boxing glove in a makeshift ball, then chalked the bases and pitcher’s box. Fast forward almost a century and a half, and today’s version of softball is enjoyed by over 40 million players. So how did we get from a tied-up boxing glove to today’s leagues? Track the evolution of one of America’s sports and see what it took to transform the game as we know it. After Hancock’s inventive game was spread, it became a popular pastime in Chicago that winter. While originally intended for baseball players to partake in for practice during inclement weather, softball soon took on its own importance and play was transferred to the outdoor field. It took off, and softball began to spread through the Midwest. As rules were created and amended during the following decade, it was referred to as kitten baseball, diamond ball, pumpkin ball, and even mush ball, before finally earning the official moniker of softball in 1926. Women’s softball has become a popular college sport. Softball wasn’t organized on a national basis until 1933. Michal J. Pauley and Leo Fischer presented their conception of organizing thousands of teams into cohesive organizations by state. These organizations would then be organized into national leagues. In order to get the ball rolling (no pun intended) Fischer and Pauley invited teams to participate in a tournament in the 1933 Chicago World Fair. Fifty-five teams were invited, and the teams were then divided into three main classes—fastballers, slow pitch play, and women’s leagues. An impressive 350,000 spectators took in this softball tournament, propelling the game into widespread popularity. During the next decade, it was estimated that over 5 million people began playing softball, and after the end of the Second World War, the sport began to spread to other countries. Thanks to the success of the tournament and spreading popularity, fall of 1933 saw the formation of The Amateur Softball Association. This brought about standardized rules, defined age groups, and set standards for equipment. A 12-inch ball became the youth league standard, while field size varied based on age and fastpitch and slowpitch games. In 1951, the International Softball Federation took on the role of softball competition governance. The first women’s fastpitch world championships occurred in 1965 in Melbourne Australia, and the first men’s world softball championships took place the following year in Mexico City. Since 1970, softball world championships games have taken place every four years. 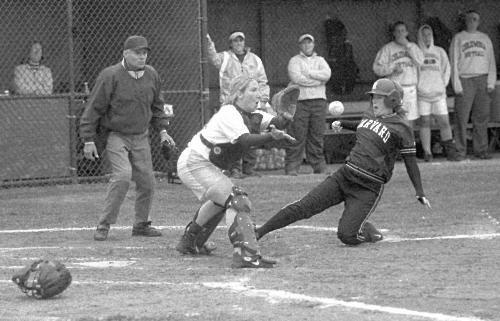 In 1996, softball was added to the Olympic program, and was played every four years in the summer games until 2008. In July of 2002, the IOC voted to exclude baseball and softball from the 2012 Olympic program, which had a worldwide impact on softball playing, as governments like Australia pulled back funding to the sport thanks to the decision. Good news came earlier this year however, as the IOC voted to re-include baseball and softball in the 2020 Summer Olympics. We couldn’t discuss the evolution of softball as a sport without touching on the way equipment has transformed through the years, specifically in terms of bats. In the beginning, bats were tipped with rubber, and wooden bats were used for almost a full century. Aluminum bats were introduced in 1970, and reinforced with stronger grades of aluminum in following years. In 1993, single-walled titanium softball bats were introduced, then composite hybrids began hitting the scene. There are also key differences these days between slow pitch bats and fast pitch options. Fast pitch bats are generally lighter, as the increased speed of the pitched ball means the hitter must swing with more immediacy. In contrast, slow pitch bats are designed to hit a ball that comes in at around 25 mph, and are less likely to be damaged with slower pitching styles. Within these two classifications, there are even further adjustments made. Just a look at the massive amount of slow pitch softball bats at Baseballmonkey.com; the company explains to potential buyers that it offers varied options for different leagues and hitting styles, meaning today’s softball player has a variety of decisions to make when purchasing equipment. It’s easy to see with examples like this that softball continues to evolve, even today. As evidenced by its illustrious and longstanding history, softball has undergone major changes since its inception back in the 19th century. From quick pickup game to international play, this beloved sport has made its mark on the world of sports, and we’re sure to see more innovation as the years go on. ← Injured Playing Sports? What Do You Do Next?